ukrainianweek.com/The Cradle of Indo-Europeans >> …The separation began in Southern Ukraine, on the frontier between the fertile right bank of the Dnieper inhabited by Cucuteni-Trypillian farmers and the Eurasian steppes, which from then on became home to agile and warlike pastoral peoples. In the 4th millennium B.C., the territory of Ukraine became a buffer zone between the settled and peaceful farmers of Europe and the aggressive nomads of the Eurasian steppe. This defined Ukraine’s turbulent history for the next 5,000 years, up to the 18th century. Cattle breeding skills inherited from the Cucuteni-Trypillians quickly evolved into a separate industry in the steppes and forest-steppes of left-bank (eastern) Ukraine. Herds of cows and flocks of sheep were constantly relocating in search of pastures, making the pastoralists very flexible. In turn, this facilitated the spread of wheel transportation and the domestication of horses, which were initially used to pull wagons alongside oxen. This constant search for pastures led to violent conflicts among neighbouring groups and the militarization of these communities. Unlike the farmers who had matriarchal societies, the pastoralists’ leaders were male, since shepherds and warriors provided for life. The opportunity to own many cattle triggered stratification. In the militarized society, warlords emerged. Early fortresses were built, and cults of warriors and shepherds as supreme gods spread, along with common symbols such as chariots, weapons, horses, the sun cross (later appropriated by the Nazis) and fire. The steppe economy of the 4th-3rd millennia B.C. was based on seasonal livestock grazing. The families settled in river valleys and grew barley and wheat, bred pigs, hunted and fished, while men spent more and more time with the herds of cows, sheep and horses at summer pastures. In spring, shepherds and armed warriors would take the cattle far into the steppes and return home in the fall. As pastoralism developed, this lifestyle grew more nomadic. Thus, the Ukrainian steppes played a pivotal role in the emergence of Indo-European peoples. Their pastoral economy, the spread of wheeled transportation, the use of horses and oxen as draft animals and horseback riding gradually turned them into aggressive nomads and launched the unprecedented spread of the earliest Indo-Europeans from Southern Ukraine in the vast steppes all the way from the Upper Danube in the west to Altai and India in the east. Most Indo-European river and lake names are between the Rhine and Middle Dnieper in Central Europe. Some other elements of the Indo-European protolanguage, such as mountains and swamps, aspen, beech, yew, heather, grouse, beaver and the like do not fit into the steppe flora and fauna. These are more typical in parts of Europe that are cooler and damper than Southern Ukraine ... At the lower Danube, migration split into three directions. One went southeast to Anatolia. The other headed to the Balkans and Greece, and the third moved westward to Central Europe. Thus, the pastoralists that inhabited the Black Sea steppes in the 4th-2nd millennia B.C. 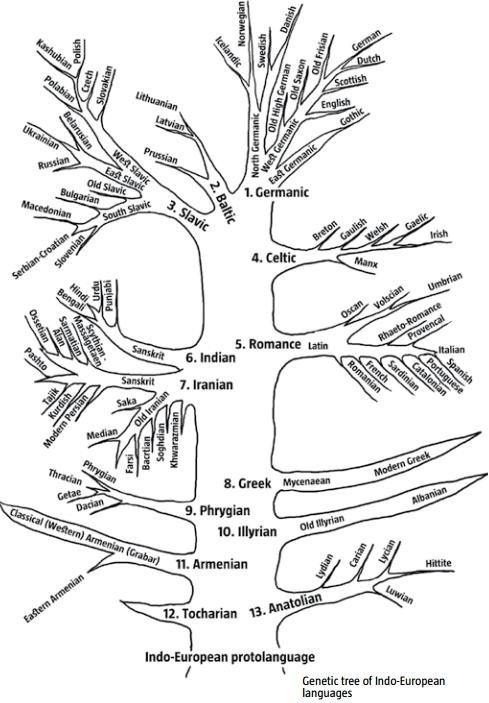 became the distant ancestors of Indo- and Iran Aryans, and the Anatolian, Greek, Armenian and Phrygian branches of the Indo-European language family. As they reached the upper Danube, they shaped the Central European epicentre of the Indo-European ethnogenesis from which the ancestors of Celts, Italics, Illyrians, Germans, Balts and Slavs emerged. The Evolution of the Indo-European Languages by Dr. C. George Boeree First, let’s look at phonetic similarities and differences among some of the oldest representatives of the main branches of the Indo-European languages. What groupings might we tentatively make on the basis of these comparisons? 6. Gothic is an outlier in the Centum group. A sticking point is the place of Germanic: It seems to be both clearly tied to Baltic, yet phonetically quite distinct. It is, in fact, quite distinct from all its relations! One theory is that its similarity to Baltic is in part due to close proximity and continued contact, and that its phonetic distinctiveness is due to a pre-Germanic substrate of megalithic people sometimes referred to as “the Folk.” (I2-ydna). It is possible that pre-Indo-European neolithic people in France and England likewise influenced the development of the Celtic languages as well – another “Folk” perhaps. The neolithic people of the Iberian peninsula and southwestern France – including the ancestors of the modern Basques – do not appear to have had too significant an effect on the Celtic of that area, nor on the later Latin. Other languages have had more obvious contact with other language substrates. 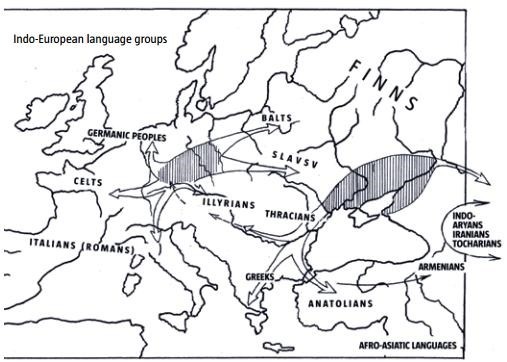 The Hittites and other Anatolians clearly came into an area already well-populated with non-Indo-Europeans, which no doubt hastened the rather dramatic phonetic and morphemic simplifications characteristic of those languages. The Armenians appear to be closest to the Indo-Iranians in phonetic and morphemic structure, and were possibly influenced by centuries of contact with them as well as the Hittites, Semites, and Caucasians. The Mycenaean Greeks may have been influenced by an Anatolian substrate in Greece and the islands (the Pelasgians? ), further complicated by a second wave of Greeks (Dorians). c. 5000 bc. Homeland: The Danube River valley (Wallachia and Hungary). Farming learned from the people of Asia Minor. Cultivation of native rye and oats and domestication of native pigs, geese, and cattle begins. Strong tribal sociey develops. There are many reasons for choosing the Danube River valley: Farming is possible, although the land is less than desirable to more powerful tribes from the south; the flora and fauna of the valley, as well as for other natural features such as hills and rivers, are represented by the oldest words we can reconstruct; it includes the natural ranges of wild horses which, when later domesticated, would become the Indo-European’s “ace card”; the area is central to the eventual expanse of the Indo-Europeans, with due allowance for the more rapid expanse commonplace over steppe-lands; the area is also in close proximity to some of the most conservative recent representatives of the family. The most compelling reason is the presence of the Danubian culture, with its linear incised pottery, at this same time. The culture spreads soon after in exactly the directions that would account for the spread of PIE. There are, of course, many other possibilities. The most common suggestion is the steppes north of the Black Sea, for many similar reasons. I believe that the strong tribal social structure suggests that the Indo-Europeans were farmers before they were pastoralists. It is highly unlikely that they went straight from steppe hunter-gatherers to sophisticated pastoralists in one step. c. 4000 bc. Proto-Anatolians move east to the northern Caucasus. They would be profoundly influenced by the advanced cultures of Asia Minor and beyond. Proto-Tokharians move east into the Ukraine. These people are the most likely originators of the horse culture. There is also plenty of evidence of ox-drawn wagons with disk wheels in the western steppes. A western dialect emerges on the upper Danube and beyond. The enclosed steppe of the Hungarian Plain is an ideal position to blend farming with a horse culture. c. 3000 bc. Copper working, begins in Thrace and the Danube valley and reaches Germany by 3000 bc. Domestication of the horse spreads from the Ukraine. Within a thousand years, horsemanship spreads from the Ukraine throughout the Indo-European area, even into Scandinavia. It is the steppe inhabitants who change most dramatically into true pastoral societies. In the more wooded areas of Europe, horse ownership begins to differentiate a warrior nobility from commoners. Of course, use of the horse spreads to the non-IE societies of the Middle East as well. The disk-wheel wagon has spread from Russia across Europe to Holland. The Proto-Anatolians move from the Caucasus to Asia Minor. The Proto-Tokharians continue east to the steppes, towards the Tarim Basin in northwestern China. They may be the people known to the Chinese as the Yüeh-chi, and may have been the core of the Kushan Empire of the first century AD. The main body of Indo-Europeans expands into Thrace, the Ukraine, Bohemia, and Poland, and begins to differentiate into a northern dialect – Bohemia, Poland, and Hungary, represented by the Funnel Beaker culture and a southern dialect – Wallachia, Thrace, and Ukraine, continuing the Danubian culture. The original inhabitants north and west of the Carpathians, likely speakers of Uralic languages, are pushed further north and west. c. 2500 bc. Bronze working develops throughout Indo-European area. The Proto-Italics, who speak a western dialect, move west and south from the Slovenia area into Italy. There they would encounter well-established pre-PIE people, possibly the ancestors of the Etruscans and Rhaetians. The Proto-Illyrians, speaking a western dialect (perhaps), move south from the northern Croatia area into Illyria (the Dalmatian coast). One branch of the southern dialect – Proto-Hellenic – moves south into Macedonia, Greece, and the Aegean islands, absorbing much of the Pelasgian people and culture. By 1500 bc, the southern-most tribes would establish the Mycenaean culture. The Proto-Germanics move into Scandinavia. Odd aspects of Proto-Germanic may be due to interaction with northern Celtic tribes, Baltic tribes, and possibly to the presence of native speakers of Uralic languages in Scandinavia. The remaining main body of Indo-Europeans (the Baltic, Poland, Bohemia, the Hungarian Plain, Wallachia, Thrace, the Ukraine and the neighboring steppes) – both northern and southern dialects – undergoes the Satem phonetic changes. c. 2000 bc. 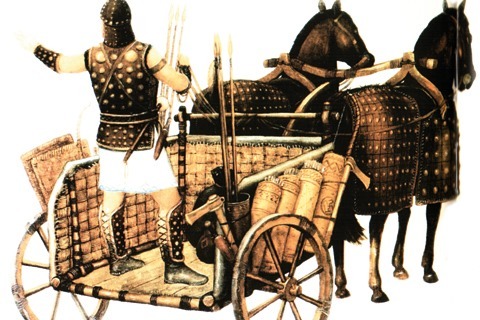 The horse-drawn, two-wheeled chariot, with spoked wheels, is developed in the western steppes, and spreads quickly to the Balkans as well as the Middle East. A branch of the southern Satem dialect – Proto-Indo-Iranian – expands from Ukraine and the steppes into Afghanistan, Iran, and into India. One tribe – the Mittani – goes as far west as northern Mesopotamia. The well-established cultures influence the newcomers greatly, but the Proto-Indo-Iranians maintain their language. The main body of the southern Satem dialect expands into the Ukraine to become the Cimmerians, leaving the Dacians in the original homeland. The Celts expand further into western Europe and, in a retrograde move, back into Hungary and Transylvania. A powerful society, they pressure the original peoples of western Europe, as well as their own relations to the east. They develop the Bell-beaker culture (ca. 2800 – 1800 BC) and, later, the Urnfield culture (ca. 1300 BC – 750 BC). I suspect that the Dacians result by interaction of Proto-Dacians (a mix based on the original I2 ydna substratum, plus J/E/G neolithic farmers, plus early R1a/R1b migrations) with Celts (R1b ydna), migrating south-east from the Hallstatt culture (from the 8th to 6th centuries BC, European Early Iron Age). The people of Thrace were probably closely related to the Cimmerians, also with a southern Satem dialect. These people develop the southern steppe version of the Battle Ax culture. (R1a-ydna). The main body of the northern Satem dialect – Proto-Balto-Slavic – expands north from Poland into Belarus and the Baltic coast. With the Germans, they consititute the northern version of the Battle Ax culture. c. 1500 bc. Proto-Phrygians – possibly a branch of the Cimmerians – move from Thrace across the Bosporus to northwestern Asia Minor. The Phrygians would move into the power gap left by the collapse of the Hittite Empire around 1200 bc. Proto-Armenians – possibly another branch of the Cimmerians – move into Asia Minor, probably by means of the Bosporus. It is possible that they entered from the east coast of the Black Sea, or even across the Black Sea. In the next 1000 years, they spread over much of northern Asia Minor, but are eventually pressured into the Lake Van region. Albanian may be the sole survivor of the Illyrian languages, its many variant features due to long contact with a variety of neighbors. Or it could be the lone descendent of a Dacian dialect that later moved into the Albanian region. I lean toward the latter, but it is very difficult to tell! So little of Dacian, Thracian, Illyrian, etc. is left to us. The western Celts expand into western Iberia and the British Isles, where they absorb most of the prior inhabitants. The original inhabitants of Spain survive well into the Roman era, while the original inhabitants of southwest France survive to the present as the Basques. The Balto-Slavics differentiate into Baltic and Slavic. Both begin to expand east- and northward, at the expense of the hunter-gatherer Finno-Ugric people. The Indo-Iranians differentiate into Indic and Iranian. The Indic group rapidly expands across northern India as far as Magatha. The Iranians split into powerful tribes, notably the Persians and the Medes, by the 800’s bc. The Iranians remaining in the steppes would come to be known as the Scyths and Sakas. The powerful Scyths expand westward at the expense of the remaining Cimmerians. c. 1000 bc. 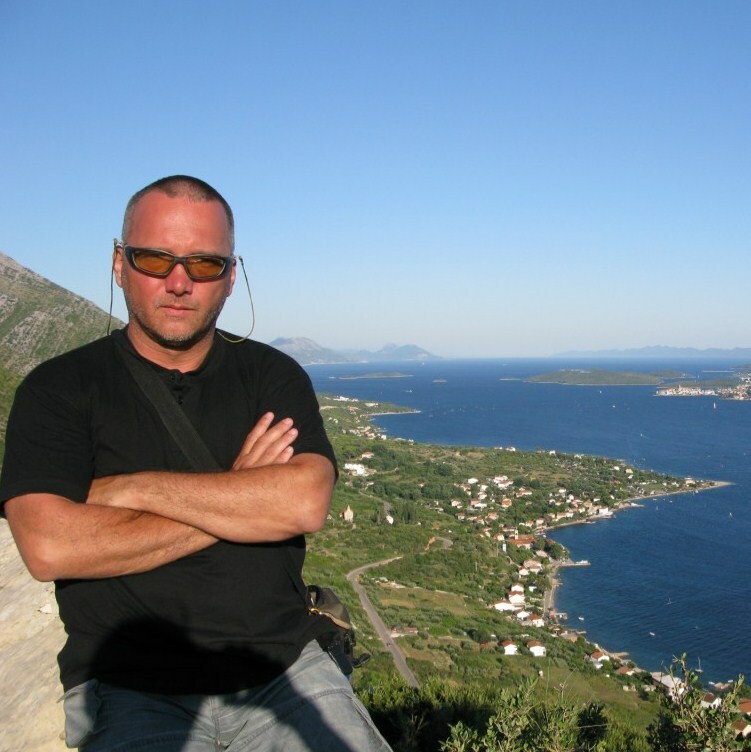 Iron working begins in the Balkans by 1000 bc. It reaches Britain by 800 bc. The “Age of Empires” begins in earnest. This entry was posted in Aryans, ethnogenesis, Etnogeneza Rumânilor, Linguistics and tagged Cucuteni, Indo-Europeans, Proto-Anatolians, Proto-Celts, Proto-Germanics, Proto-Hellenic, Proto-Italics, Proto-Tokharians. Bookmark the permalink.